ADV-8124 - 8/16/24-Channel H.264 SD Encoder | AdvancedDigital Inc.
ADV-8124 is high quality multi-channel professional video/audio encoder with multiplexer. It has 8/16/24 encoding channels with CVBS video and unbalanced audio inputs. 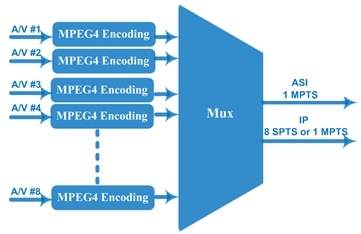 It supports MPEG-4 AVC/H.264 video encoding and MPEG1 Layer II Audio encoding. ADV-8124 has modular design, up to 3 standalone modules (24 channels) can be installed. Each module multiplexes 8 encoded TS to generate a MPTS output through GE output port. Each module also can output one MPTS through 2 ASI output ports. 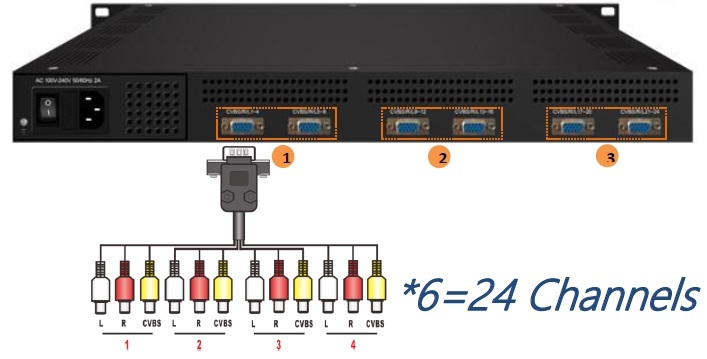 High integration and cost-effective design make this device widely used in variety of digital distribution systems such as CATV digital head-end, satellite and terrestrial digital TV, surveillance, etc.